"Space cakes" redirects here. For the Alanis Morissette EP, see Space Cakes. "Hash brownies" redirects here. It is not to be confused with hash browns. A cannabis edible, also called cannabis-infused food or cannabinated food, is a food product that contains cannabinoids, especially THC. Cannabis edibles are consumed for both medical and recreational purposes. Because cannabinoids are soluble in lipids and alcohols, cannabis must be cooked with one of these two substances in order to infuse the cannabinoids into the food and activate the psychoactive effects. Cannabis edibles are consumed for both medical and recreational purposes. During preparation, the cannabis or its extract must be heated sufficiently to cause decarboxylation of its most abundant cannabinoid, THCA, converting it into the psychoactive THC. The oil-solubility of cannabis extracts has been known since ancient times, when Sanskrit recipes from India required that the cannabis be sautéed in ghee before mixing it with other ingredients. Making a tea by boiling cannabis in water is a highly inefficient way to extract psychoactive cannabinoids. Adding milk (which contains fat) when steeping, however, makes it much more efficient than using plain water. 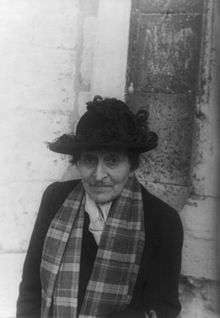 Modern interest in edible cannabis is credited to the publication of The Alice B. Toklas Cookbook. Toklas included a recipe for "Haschich Fudge" which was contributed by artist and friend Brion Gysin when it was published in 1954. Although it was omitted from the first American editions, Toklas' name and her "brownies" became synonymous with cannabis in the growing 1960s counterculture. Some authors claim that oral consumption of cannabis, when properly cooked, is a more efficient way to absorb cannabinoids than smoking it, and can result in a similar psychoactive effect or "high" as smoking cannabis, although it may be delayed or mitigated due to slower absorption of the THC from the digestive tract. Whereas the effects from smoking cannabis are usually felt within a few minutes, it can take up to two hours to reach full effects after ingesting it. Cannabis produces THCA, an acid with the carboxylic group (COOH) attached. 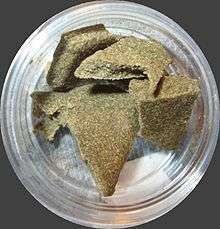 THCA is not very psychoactive. It is only when the carboxyl group is removed that the THCA becomes THC, which is psychoactive. Liquid THC and other cannabinoids have a boiling point of between 180-200 °C (355-392 °F). Before it turns gaseous, the carboxyl group is released from the molecule as carbon dioxide and water vapor at around 106 °C (220 °F). In the cooking of edible psychoactive products, some research indicates heating cannabis to a temperature of 122 °C (251 °F) for 27 minutes to be the optimum method to optimize THC:THCA ratios. Because oral doses are processed by the liver before entering the bloodstream, oral THC produces high levels of active metabolite 11-Hydroxy-THC, while smoked cannabis does not. 11-OH-THC is more potent than THC and crosses the blood–brain barrier more easily. Hash cookies are bakery products made using hashish. One is not usually able to tell the difference between regular baked goods and those containing drugs before consumption, but they tend to have a slight greenish tinge with marijuana, and they often emit a faint odor. A mild flavor can be detectable if sufficient quantities are used. Many resources for recipes, preparation, and dosage are available online, though they vary greatly in effectiveness and quality. The writer Alice B. Toklas's inclusion of her friend Brion Gysin's recipe for "Haschich Fudge" in her 1954 literary memoir The Alice B. Toklas Cookbook caused a sensation at the time, and led to her name becoming associated with cannabis food with the use of the phrase "Alice B. Toklas brownies" for many years afterwards. "Space cakes" is a common name for muffins, brownies, and cookies baked with marijuana, which are very popular in the Netherlands. It used to sometimes be popular to frost these with psilocybin mushroom frosting, but this practice has since been discontinued when psilocybin mushrooms were banned in 2008. Cannabis-infused drinks, or cannabinated drinks, have become an increasingly popular method of consuming cannabinoids, especially in U.S. states that have legalized cannabis for recreational use. Companies such as Dixie Elixirs and Mirth Provisions are two of the largest companies in the emerging cannabinated beverage market. Cannabis oils, or marijuana oils are products based in cooking oils that have been infused with cannabinoids by mixing cannabis with the heated oil. Ground cannabis plant material must be "activated" by the decarboxylation of (−)-trans-Δ9-tetrahydrocannabinol acid to (−)-trans-Δ9-tetrahydrocannabinol (THC) in order to become a psychoactive compound. This activation process can be done before or during the extraction into oil. A recent research study on the decarboxylation of THC performed by heating ground plant material found the highest yield of psychoactive THC to be achieved at 110 C after 110 minutes. Once this chemical conversion has been accomplished, the ground plant material must be solvated in a lipid solvent. Any cooking oil can be used for this. 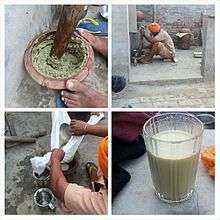 The activated plant material should be mixed with the oil vigorously for 5–10 minutes, and then the oil can be strained depending on preference. Activation and solvation can be accomplished simultaneously by mixing the plant material into pre-heated oil. Using a double boiler is a common method for this extraction technique as it keeps the temperature at a near-constant 100 C. As a general rule, a higher temperature leads to a faster reaction rate and therefore requires less cooking time to be activated; it should be noted however that temperatures above 140 C run the risk of beginning to vaporize compounds out of the mixture and temperatures below 90 C may not lead to significant chemical conversion on a time scale of less than 24 hours. Cannabis cooking oils are available to medical cannabis patients in a variety of organic blends for various cooking applications. Infusing raw cannabis into melted butter creates an infusion known as cannabutter. Heating the raw cannabis in melted butter allows the cannabinoids to be extracted by the fat. A more complicated process is using a double-boiler, or slow cooker, cheesecloth or tea strainer and funnel. Cooking time varies from 10–15 minutes to 24 hours at 93 °C (199 °F), and partly depends on the amount of cannabis used - .8 grams takes from 15–25 minutes, even though it is better to extend that time a bit more by not exceeding the 100 °C (212 °F) border, or even lowering to 90 °C (194 °F), to 24 hours for 30 grams. Because cannabis resins are soluble in alcohol, an effective way of adding them into dishes is through cooking brandy or rum infused with cannabinoids. Generally, stems and leaves of the marijuana plant are used due to their lower THC content when smoked. When infused in high-proof grain-based alcohol (such as Everclear) it becomes what is commonly known as Green Dragon. Creme de Gras (a play on the English "grass", as creme de gras translates literally as "cream of fat") is a flavored liqueur made from cannabis. It can be added to coffee and other beverages. ↑ Rosenthal, Ed (January 2, 2003). "Does marijuana have to be heated to become psychoactive?". Cannabis Culture. Retrieved 16 October 2010. ↑ Gottlieb, Adam (1993). Cooking with Cannabis: The Most Effective Methods of Preparing Food and Drink with Marijuana, Hashish, and Hash Oil. Ronin Publishing. p. 7. ISBN 0-914171-55-0. ↑ Drake, Bill (2002). The Marijuana Food Handbook. Ronin Publishing. p. 18. ISBN 0-914171-99-2. ↑ Eplatt, Layla (April 20, 2015). "Go Ask Alice: The History of Toklas' Legendary Hashish Fudge". Scientific America. Retrieved 22 September 2016. ↑ Gottlieb, Adam (1993). Cooking with Cannabis: The Most Effective Methods of Preparing Food and Drink with Marijuana, Hashish, and Hash Oil. Ronin Publishing. p. 8. ISBN 0-914171-55-0. 1 2 Veress, T.; Szanto, J.I. ; Leisztner, L. (9 November 1990). "Determination of cannabinoid acids by high-performance liquid chromatography of their neutral derivatives formed by thermal decarboxylation: I. Study of the decarboxylation process in open reactors". Journal of Chromatography A. 520: 339–347. doi:10.1016/0021-9673(90)85118-F.
↑ Government Marijuana Researcher Speaks Favorably About Marijuana's Medical Utility NORML September 26, 1996. ↑ Possible hepatotoxicity of chronic marijuana usage Sao Paulo Med. J. vol.122 no.3 São Paulo May 2004. ↑ "Foodie Gossip: Cooking with Cannabis: Medical Edibles Go Mainstream". Foodiegossip.blogspot.com. 2010-12-10. Retrieved 2011-01-25. ↑ Pilcher, Tim. The Cannabis Cookbook. Running Press. ISBN 978-0-7624-3090-1. ↑ Gottlieb, Adam (1993). Cooking with Cannabis: The Most Effective Methods of Preparing Food and Drink with Marijuana, Hashish, and Hash Oil. Ronin Publishing. p. 31. ISBN 0-914171-55-0.